First of all—what exactly is a Vector? Vector graphics are images created in drawing programs like Adobe Illustrator or Corel Draw. The images are made up of paths that create lines and curves, and are resolution independent, meaning you can shrink or enlarge the image and it won’t become distorted or blurry. All digital images are either Vector or Raster (Bitmap/pixel). Below is a sample of Vector versus Raster:Zoom in on any Vector images, and it will have clean edges. That’s the main reason why logos should ALWAYS be in Vector format. Raster (Bitmap) images consist of pixels—like you see in photographs. Bitmap files often end in: bmp (Bitmap Image File), tiff (Tagged Image File Format), jpeg (Joint Photographic Experts Group), gif (Graphics Interchange Format), and png (Portable Network Graphics). The most common software program for Bitmap is Adobe Photoshop. Starting with the right image is the first step to having your final print job look clean and professional. 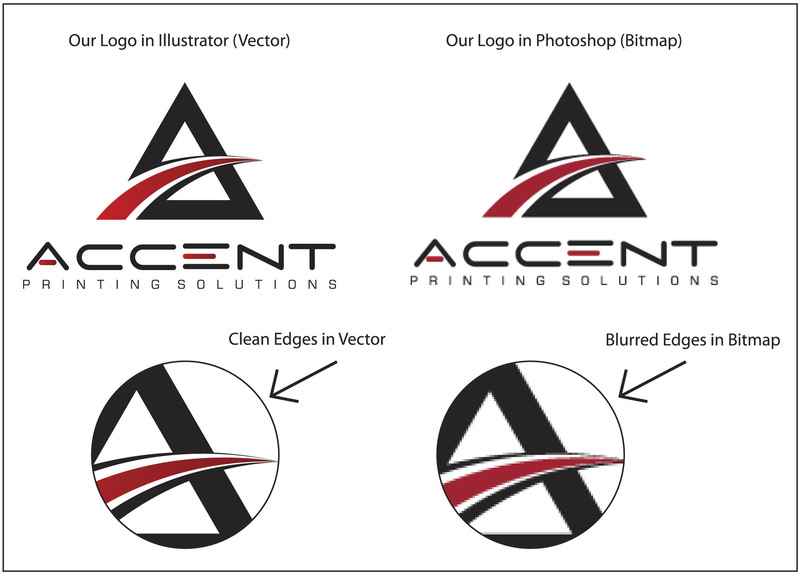 At Accent Printing Solutions, we receive A LOT of logos in Bitmap and often have to recreate the art. That’s time and money our clients didn’t count on. Vector art is easy to manipulate and recolor. It can be scaled up without losing quality—think of posters and billboards. Fonts can be converted to line art, so you don’t have to worry about the type changing. Of course, most brochures and printed materials are a combination of Bitmap and Vector. It’s understanding the limits and advantages of each format that will result in a nicely printed piece. And when in doubt about what format to use, remember what a graphic teacher once told me, “Illustrator is for ILLUSTRATIONS, and Photoshop is for PHOTOS!” Pretty easy way to remember.